Wonderful news, everybody! 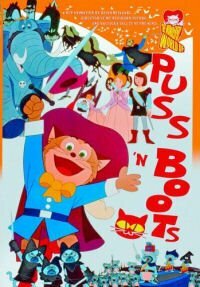 Puss in Boots has finally been released on DVD in America! For fans of animation and Hayao Miyazaki, this will certainly become one of the most cherished releases of the year. Puss in Boots is one of the great slapstick cartoons, a freewheeling joyride that stays in your head and sticks to your bones. It's probably the best animated comedy ever made in Japan (although I'm often torn between this and Animal Treasure Island). The comedy will remind Westerners of their favorite Tom and Jerry or Road Runner cartoons, and the action scenes are endlessly inventive and thrilling. This movie was released in 1969 at Toei Doga, and was a tremendous rush of freedom for the animators; after three years of battling the studio over Horus, Prince of the Sun, everyone was set loose like children in a candy store. All the major Toei talent is on display: Yasuji Mori, Yoichi Kotabe, Yasuo Otsuka, Hayao Miyazaki, Akemi Ota, Reiko Okuyama. The director, Kimio Yabuki, gave everyone free reign, letting ideas flow freely; this is very much an animators' movie, and is an excellent example of Japan's cutting edge. The story is fairly standard fairy-tale fare, with Pero, the title hero, helping a shy peasant win the heart of a beautiful princess, rescue her from a towering villain, and avoid pursuit from cat assasins. There are a number of song-and-dance numbers, which were standard in Japan's post-war years, but was now headed for extinction thanks to Horus. Sounds a little Disney-fied, but thankfully, everything moves at such a clip, and the gags keep flying at you so fast, that the plot barely has a chance to keep up. It's really just a bare framework to setup all the jokes and chase scenes, which is what a comedy cartoon should be, anyway. The final act of Puss in Boots, the assault on the magician's castle, is one of the most famous segments in all of anime. It was animated by Otsuka and Miyazaki in tag-team fashion; the castle chase is practically its own self-contained movie, and you soon feel as though the rest of the movie is just a grand set-up, just to get to this moment. This is one of Miyazaki's greatest achievements as an animator, as an emerging master of comedy and action. If you're observant, you'll start spotting endless Puss in Boots riffs nearly everywhere. Animal Treasure Island, Castle of Cagliostro, Nausicaa, The Cat Returns. That's just a few titles off the top of my head. So, in case you haven't figured out, this is a beloved movie. Toei reached its peak with Horus (although they didn't know it yet), and Puss in Boots was still riding on that wave. But it was the beginning of the end; by the time Animal Treasure Island was released in 1971, Otsuka had already jumped ship, and soon everyone would follow, carrying the Toei tradition to A Pro, Zuiyo, Nippon Animation, Telecom, and then finally Ghibli. Discotek did a great job with the DVD. The original Japanese movie poster is on the cover, which is a great plus for me. There are a couple extras on the disc, which is an improvement from earlier releases, the subtitles are good, and the original soundtrack-with-subs is the default option, which is really nice. This is a new company, and they're fairly small, so they deserve our support. Show 'em some love. Thanks for the tip! I just ordered a copy! Also, you're doing a great job w/ this blog! I'm so enjoying your reviews/observations/musings on all things Ghibli...pls. keep this going as long as you can!